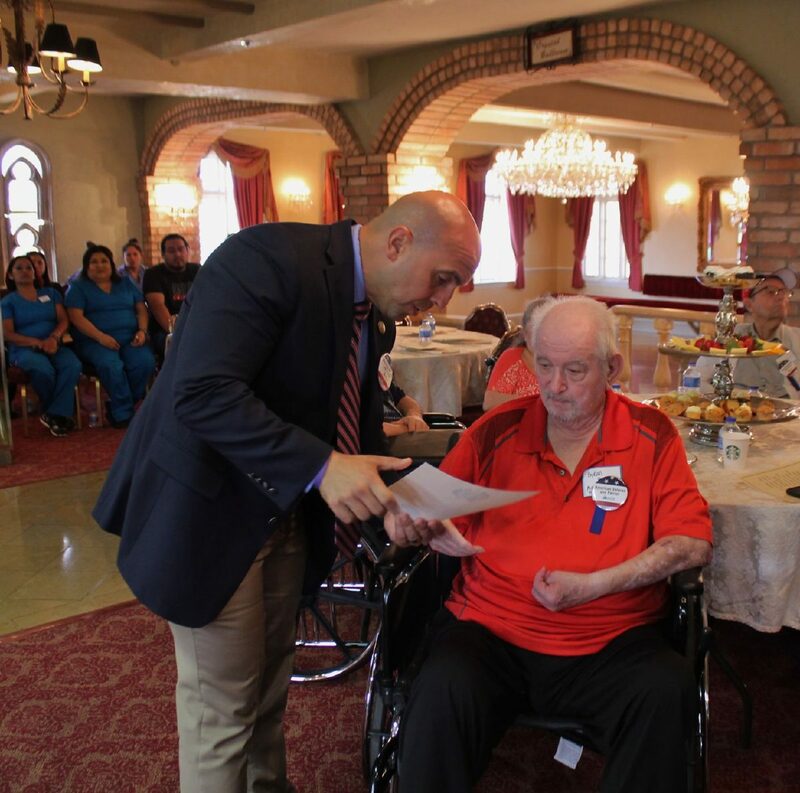 WESLACO — Within the historic walls of the Villa de Cortez, appreciation was expressed this week during an event for local veterans in area nursing homes. About 150 people turned out for the first Operation Celebrate Veterans that honored 40 veterans from nine nursing homes around the Rio Grande Valley. The majority were men, but two women were among those recognized for their military service. The day began with Weslaco High School JROTC students positioned at the entrance raising their swords in a saber arch as each of the veterans made their way inside the building. After their duties outside, the students proceeded with the presentation of the colors. Following introductions, each of the veterans received a certificate of appreciation. Juan Rivera, Molina Healthcare community engagement coordinator, began reading the names aloud while state Rep. Armando “Mando” Martinez of Weslaco personally handed each veteran their certificate. Byran Rue, an Air Force Veteran, looks down at the certificate of appreciation that is handed to him by state Rep. Armando "Mando" Martinez on Wednesday at the 'Casita Room' inside the Villa de Cortez in Weslaco. 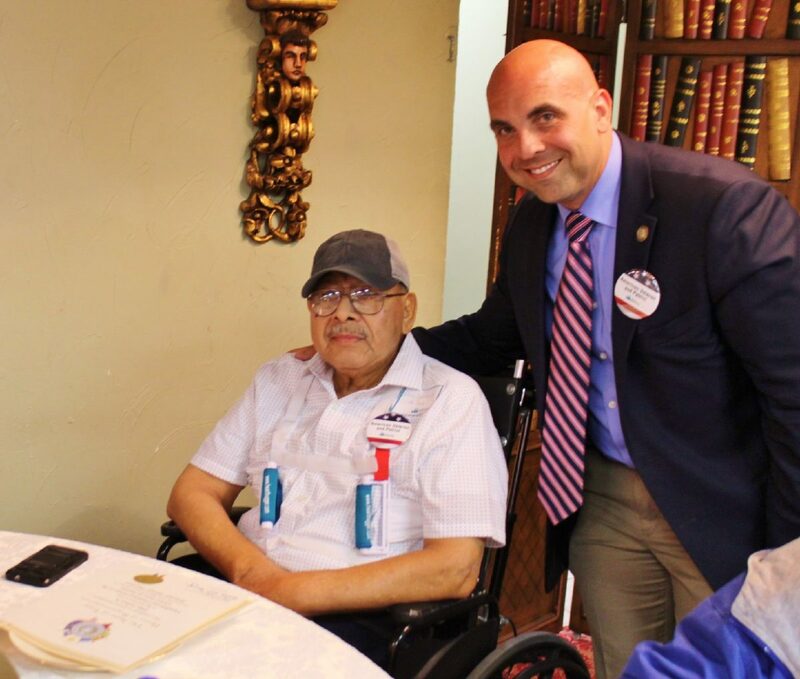 State Rep. Armando "Mando" Martinez poses with Air Force veteran Elias Salinas Jr., on Wednesday at the 'Casita Room' inside the Villa de Cortez in Weslaco. After the certificates were handed out, all the veterans were allowed to reminisce about the past and share their stories. “It is having them remember their story and having them tell their story, so the history is not forgotten and having us acknowledge them for the service they have given our country,” Rivera added. One of those honored was 84-year-old Byran Rue, an Air Force veteran who served 14 years specializing in air traffic control based in Harlingen. He also spent seven years in Germany. “I was making sure planes were flown in the right direction,” Rue said about his job. Rue was already married at the time with his two children born in Germany. He later was stationed in France, but the family didn’t move with him until much later. During his time in Germany, he learned to speak the language and still knows the language minimally. “When I got off the plane, I kissed the ground,” Rue said about missing home. Another veteran was 75-year-old Elias Salinas Jr. who served in the Air Force for four and a half years as an electrician. The room, decorated in a patriotic theme, was filled with reminders of about past military action. One corner of the room had four tables placed side-by-side displaying wartime photographs meant to trigger memories among the group.